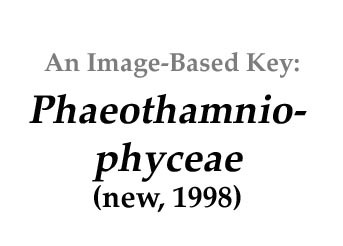 The Phaeothamniophyceae are a relatively new class separated from the Chrysophyceae (Bailey et al. 1998). Included are photosynthetic protists containing chlorophylls a and c (c1 and c2), and β-linked storage reserve (chrysolaminarin). Accessory pigments include fucoxanthin, diadinoxanthin, diatoxanthin, β-carotene and heteroxanthin. The combination of fucoxanthin and heteroxanthin is known only for these organisms. The rbcL sequences of Phaeoschizochlamys, Phaeothamnion, Stichogloea, Pleurochloridella, along with representatives of other chromophyte classes, were analyzed phylogenetically and provided independent support for recognition of the Phaeothamniophyceae as a distinct taxon.. In addition to the Chrysophyceae, Class Phaeothamniophyceae is similar to Bacillariophyceae, Eustigmatophyceae, Raphidophyceae, Silicoflagellates, Synurophyceae, Tribophyceae, and several additional smaller classes, and has been grouped with them in Division Ochrophyta, Kingdom Chromista (Cavalier-Smith 1986), or Stramenopiles (Brown and Sorhannus 2010). They are also grouped with other classes such as browns and diatoms that have in common two different types of flagella in the motile stages, into the 'stramenopiles' ('straw hairs') and/or 'heterokonts' (differing poles i.e. flagella). Included are both photosynthetic and heterotrophic forms. Recent publications refer to the new class as 'proposed' and perhaps a better classification, while retaining the older Chrysophyceae intact (Nicholls and Wujek 2003). Bailey, J.C., R.R. Bidigare, J.J. Christensen, and R.Andersen 1998. Phaeothamniophyceae classis nova: A new lineage of chromophyes based upon photosynthetic pigments, rbcL sequence analysis and ultrastructure. Protist 149:245-263. Nicholls, K.H., and D.E. Wujek 2003. Chrysophycean algae. In: Wehr, J.D., and R.G. Sheath Eds. ), Freshwater Algae of North America (Chapter 12). Academic Press.